This is a great kit for travel. It also makes a great gift. 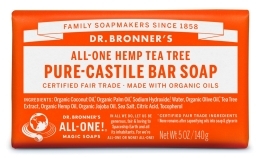 Dr. Bronner’s liquid soap (59 ml) - these soaps are renowned for their quality (made with certified organic oils), versatility and eco-friendliness. Dr. Bronner's organic lip balm (4 gr.) - The organic avocado oil and beeswax provide excellent lip protection while the organic jojoba and hemp oils assist moisturization. Dr. Bronner's Hand Sanitizing Spray (59 ml) - Certified organic to USDA National Organic Program standards, Dr. Bronner's Fair Trade & Organic Hand Sanitizing Spray is free of GMO-alcohol and petrochemical thickener. With added organic glycerin for moisturizing the skin.